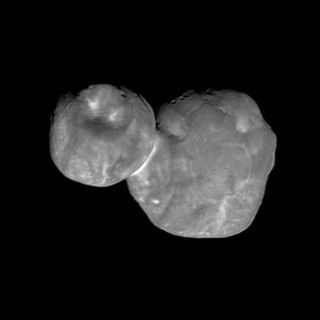 The New Horizons spacecraft captured this image of the Kuiper Belt object nicknamed Ultima Thule, snapping the picture from about 4,200 miles (6,700 kilometers) away on Jan. 1. NASA's New Horizons mission has shared its most detailed view yet of the Kuiper Belt object, nicknamed Ultima Thule, that the spacecraft flew past on Jan. 1. It's become nearly impossible to remember that just a few weeks ago the object was a fuzzy blur. The image was taken when the spacecraft was about 4,200 miles (6,700 kilometers) away from Ultima Thule, about 7 minutes before the probe made its closest approach to the object. Between the close proximity of the object and the angle of the light hitting it, the image is already helping scientists better understand the distant object. "This new image is starting to reveal differences in the geologic character of the two lobes of Ultima Thule and is presenting us with new mysteries as well," Alan Stern, principal investigator for the mission, said in a statement. "Over the next month, there will be better color and better-resolution images that we hope will help unravel the many mysteries of Ultima Thule." This photograph is the first to clearly show some of the small craters on the object, which are here shown at the top of the image, where day and night meet. The picture also offers a particularly detailed view of a large depression on the space rock. Seen in the left of the image, it is about 4 miles (7 km) wide. And while scientists had already identified the bright necklace- or collar-like band where the two lumps of rock meet, this image shows the feature in greater contrast. New Horizons made its flyby of the object, officially known as 2014 MU69, on Jan. 1. However, the spacecraft will need about 20 months to send all its data back to Earth, because the probe is so far away and is working with such a low power supply.